Sega's on a bit of a brawler blitz, with Streets of Rage 2 hitting the App Store today, and has plans to bring more games to iOS devices soon. Back in the early 1990s, the Sega Genesis dominated when it came to quality console brawlers. While several of these games have already been released for both the Virtual Console and Xbox Live Arcade, Sega has now revealed that one of its best-loved brawlers has come to the iPhone, and even more are on their way. 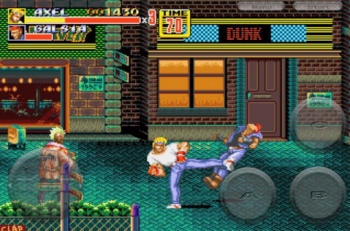 The publisher announced today that the iconic Streets of Rage 2 has launched on the App Store. Meanwhile, Streets of Rage 3 -as well as Golden Axe II and Golden Axe III- are set to hit the App Store later this Spring. Currently, Streets of Rage 2 is selling for $2.99. Ironically, the game was launched the same week that Sega's lawyers killed the fan remake of the original Streets of Rage because (according to the publisher) "we need to protect our intellectual property rights and this may result in us requesting that our fans remove online imagery, videos or games in some instances."